Many of these countries have their own national governing bodies and there is an international body too known as the Tug of War International Federation which has over 50 countries affiliated with it. The sport is played by both men and women, and historically was part of the Olympic Games between 1900 and 1920, but has not been included since this dates despite attempts to bring it back. There are many variations of Tug of War around the world including Sokatira in Spain’s Basque Country, Japan’s Tsunahiki, Indonesia’s Tarik Tambang and Korea’s Jul Parigi. 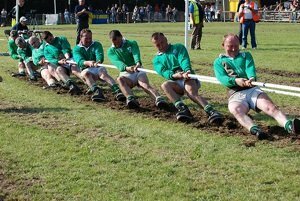 Each Tug of War team consists of 8 members, all of whom cooperate to pull the rope. Despite looking like quite a simple sport, there is some technicality to it, with team members utilising a rhythm to help pull the rope in an effective way. This is done with the help of a ‘driver’, who is not a member of the team but is in effect like a coach and they give orders of when to pull and when to rest from the sidelines. The rope is the most important piece of equipment and this should be approximately 11 cm in circumference and should be at least 33.5m long with plain, whipped ends. Other pieces of equipment that participants may use include specialist boots, back, elbow and knee supports as well as belts to support the back. In Tug of War, there is no scoring as such like you may see in other team games such as American Football or Soccer. However, because teams are pitted against each other usually in a best of three match, there is a form of scoring, in that the winner of the match must win two out the three pulls to win the match.